CJAZGURL has no current links. Partners in Life, Growth, and Fun! Heart of a Country Girl Grew up in the city but my heart has always been in the Country. I want to raise my daughter in a place where the grass is still green and there are still more trees than people! 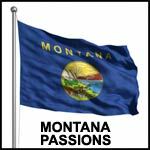 Help us keep Montana Passions free of spam and fake profiles.